Chris Morrill is the CEO of the Government Finance Officers Association (GFOA) of the US &amp; Canada. GFOA, with more than 19,000 members, promotes excellence in state and local government financial management. Chris previously served as city manager in Roanoke, VA, assistant city manager and budget director in Savannah, GA, and budget analyst in Catawba County, NC. He also served as Senior Municipal Finance Advisor to the South African National Treasury. In this position, he assisted the South African government with local government finance legislation, municipal budget reforms, and capacity building programs. Chris completed a three-year fellowship in the Kellogg National Leadership Program, exploring conflict resolution and community building in Peru, China, Northern Ireland, and South Africa. He chaired the United Way of Roanoke Valley and the Leadership Savannah Program and was awarded the Martin Luther King, Jr. Drum Major for Justice Award from the Southern Christian Leadership Conference, Roanoke Chapter. Chris Morrill is an International City/County Manager Association Credentialed Manager. 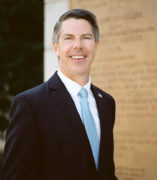 He received a bachelor of arts in political science from the College of the Holy Cross in Worcester, MA, and a master of public administration from the University of North Carolina at Chapel Hill.